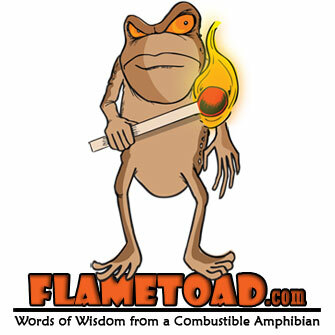 Flametoad » Blog Archive » Where Does It End? To be honest I’ve surpassed the point of outrage fatigue when it comes to our government. This has been sitting in my RSS feed for a while though, and it’s still a good reminder about important issues that are getting swept under the rug in the wake of congressional theater. General warrants do not state the name of the place to be searched or the person or thing to be seized, and they do not have the necessity of individualized probable cause as their linchpin. They simply authorize the bearer to search wherever he wishes for whatever he wants. General warrants were universally condemned by colonial leaders across the ideological spectrum — from those as radical as Sam Adams to those as establishment as George Washington, and from those as individualistic as Thomas Jefferson to those as big-government as Alexander Hamilton. We know from the literature of the times that the whole purpose of the Fourth Amendment — with its requirements of individualized probable cause and specifically identifying the target — is to prohibit general warrants. via Beware the NSA’s Ongoing Witch Hunt – Reason.com. Ashcroft must be forgiven for missing the parallel, which escapes us as well. The principal evil of the general warrant was addressed by the Fourth Amendment’s particularity requirement, Stanford, supra, at 485, which Ashcroft’s alleged policy made no effort to evade. The warrant authorizing al-Kidd’s arrest named al-Kidd and only al-Kidd. It might be argued, perhaps, that when, in response to the English abuses, the Fourth Amendment said that warrants could only issue “on probable cause” it meant only probable cause to suspect a violation of law, and not probable cause to believe that the individual named in the warrant was a material witness. But that would make all arrests pursuant to material-witness warrants unconstitutional, whether pretextual or not— and that is not the position taken by al-Kidd in this case.